"Home is wherever you drop anchor!" 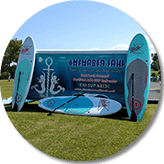 Anchored Soul is your premier stand up paddle boarding company located in Belmont, NC and the surrounding area. 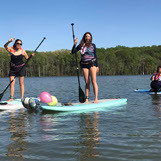 We specialize in a variety of services, including paddle boarding lessons, paddle boarding classes, paddle boarding rentals, kids paddle boarding, SUP FIT, celebration sup, and more. We have the skill and experience necessary to serve as your full-service paddle board company, offering you the best destination spots when it comes to exploring the beautiful Lake Wylie area. You won’t ever need a truck to haul the boards; just show up and we’ll provide everything you need. Voted Best of Gaston 2018 for two categories, Local Attraction and Family Amusement, our company offers respect, trust, dedication, integrity, and a commitment to exceeding the expectations of our customers. We strive to deliver complete customer satisfaction for each and every person, not only providing the paddleboards themselves but also private lessons and group lessons. We encourage and welcome paddle boarders from all levels to join us. 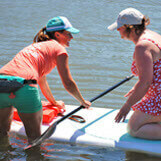 Our goal is to give you the most fun and awesome experience when it comes to paddling. 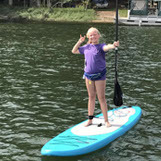 If you are interested in our paddle boarding lessons and paddle board rentals or if you would like to learn more, contact Anchored Soul today. YOLO 10’7″ Hammerhead all-around SUP, paddle, leash, & pfd….